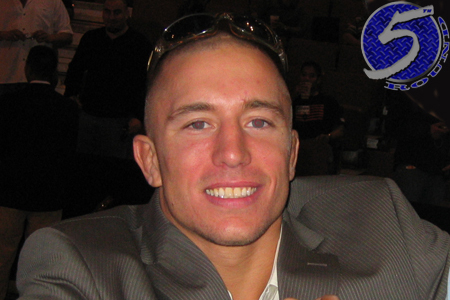 By the time the cage door slams shut at UFC 154, it will have marked 19 months since the last time welterweight king Georges St-Pierre (Pictured) defended his throne. Given his extended hiatus, GSP is expecting interim champ Carlos Condit to come out with guns blazing as he looks to knock the ring rust off the hometown hero. “I’ve been out for a long time, so he’s gonna start fast,” St-Pierre predicted during Monday’s Training Camp on FUEL TV. “I’m ready for that. I’ve been training for a quick start, straight from the beginning – BANG – really be ready to go straight from the beginning. As far as his long awaited return is concerned, St-Pierre intends to make up for lost time. St-Pierre and Condit were scheduled to collide at UFC 137 until St-Pierre was forced to bow out with a knee injury, which he had surgically repaired in December. “Rush’s” extended absence forced the UFC to manufacture a 170-pound belt. Condit captured the fabricated title by taking a decision win over Nick Diaz at UFC 143. “The Natural Born Killer” hasn’t been seen since, so he will be trying to shake off nine months of rust, as well. UFC 154 takes place November 17th in St-Pierre’s backyard of Montreal. Bell Centre hosts the festivities.